In-fill development is the process of providing a viable use of vacant or underused properties in areas that are already largely developed. Nearly all municipalities contain some degree of vacant or underused lands, which may have resulted over time for a variety of reasons including irregular lot shape, difficult access, inadequate infrastructure, environmental contamination, natural or historic resources considerations, or economic issues, among others. These sites can vary in form and size and the reasons for their past underuse may still be a challenging factor. In-fill sites are commonly found in the form of smaller scattered parcels of land that were bypassed by earlier development, were once occupied by buildings, or still contain decayed abandoned structures. When several of these small parcels border each other, they can be developed in conjunction with one another or incorporated into larger sites. Potential in-fill sites are also found in underused parcels that can accommodate additional development or larger parcels that could be further subdivided. A key element that distinguishes in-fill from other types of development is the utter importance of the compatibility of the new building design and placement with the surrounding buildings, context, and neighborhood. In-fill development accommodates growth using a concentrated pattern that consumes less land and resources, and directs development to appropriate areas. In-fill development can also serve community goals for reduced traffic congestion, maximum use of existing infrastructure, supporting alternate transit options, sustainable development/energy conservation, and opportunities for diversity in housing. Energy Conservation: Energy is conserved by directing development to established and targeted areas, consuming fewer resources, and as an alternative to sprawl development. Community Revitalization: Community revitalization can result from in-fill development, can be an impetus for other investment and economic activity, and can redevelop blighted parcels. Cost Savings: In-fill development can result in cost savings to municipalities by using existing infrastructure, public facilities, and services. Efficient use of Infrastructure: In-fill can contain development within existing service areas and avoid the costly extension of these networks. Municipal Tax Benefits: In-fill provides property tax revenues by returning vacant properties to a useful state. Preserves the Building Stock: The existing building stock can be preserved when in-fill development entails the reuse of an underused structure. Benefits Public Transit: In-fill supports public transit by increasing the population located in service areas, which can also reduce traffic congestion. Benefits Neighborhoods: In-fill helps stabilize and strengthen neighborhoods by allowing further development of compatible land uses. Restrictive Regulations: Local land use regulations may make developing existing parcels difficult through restrictive zoning or design standards. Site Constraints: Site constraints such as environmental features and contaminants, or inadequate infrastructure may exist. Cost: Project costs associated with in-fill development are sometimes greater than comparable greenfield development due to such factors as smaller project sites and higher construction costs (thus a lack of economy of scale), higher land costs, and higher possible costs of complying with development regulations that may limit infill development. Financing Difficulty: Financing may be difficult due to conservative lending practices and a perceived risk associated with small scale development. Local Opposition: There may be community opposition to a project's design or intensity, or reservations regarding increased traffic or overcrowded parking facilities. Improper Location: Potential new competition with other existing developed centers may occur if the in-fill is located outside a town center. The following discussion provides a generalized planning approach for municipalities interested in encouraging and creating a favorable climate for infill development. First, policy considerations are outlined, followed by a discussion about local regulations. A broad vision or policy that supports in-fill development should be established in the municipal comprehensive plan or economic development plan. This can take the form of a goal or objective. Types of appropriate land uses and areas for in-fill should be identified during the planning process and included in the plan. 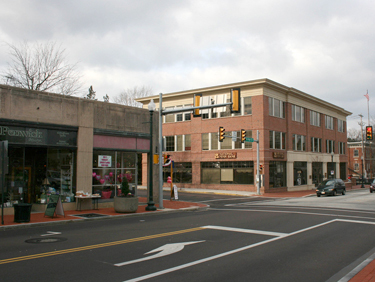 For example, a town center is an appropriate area in which to target in-fill development, as well as redevelopment, and developing a concept plan or design guidelines could be included as plan recommendations. In-fill development should be included as a plan implementation action with strategies outlining how such development will be encouraged and implemented. Planning analysis and recommendations could also occur at the neighborhood level with discussion, for example, about in-fill on a micro-level and specific planning issues such as compatibility of land uses. Encouraging cooperative efforts among interested parties is also an important policy consideration in creating a climate conducive to infill. An inventory of vacant parcels and underused sites should be undertaken to determine the existence and location of possible sites for in-fill development. There should be consideration of ownership, availability, condition, encumbrances, as well as zoning and other regulatory measures that may affect development of a site. Once an inventory is completed, sites where in-fill development would be most successful and appropriate should be analyzed and prioritized. Growth boundaries can be established to focus development in certain areas of a municipality, thereby directing where and how growth should occur. In this way, development of open lands and resources can be limited and growth guided to designated areas where in-fill and compact land use patterns are most appropriate. Creating guidelines for infill design can help alleviate community concerns about its compatibility. Their purpose is to ensure new in-fill development relates to the larger community context and fits within the existing character. Design guidelines should take into account characteristics of existing structures/sites, development/block patterns, and context, and more specifically should address site design (e.g. the relationship between buildings and streets), streetscaping and landscaping (e.g. walkways, signage, common areas, and street trees), and building design (e.g. massing, proportion, scale, rhythm, and material). Guidelines should promote new buildings that reflect rather than imitate existing structures. The process of developing guidelines offers a good opportunity for community involvement, and to clarify the design features most important to the community so these valued qualities can be incorporated into in-fill development. Design guidelines are voluntary, offering suggestions about the types of design the community feels is most compatible. Use of guidelines may also be linked to incentives, such as eligibility for grants or financial assistance, while certain design elements may be required via regulation, such as yard setbacks, parking design standards, or in a locally regulated historic district where building design can be addressed. Design issues will vary within each of Chester County's landscapes. Municipalities can adopt provisions to help implement in-fill policy. They should review ordinances and codes to determine if any provisions preclude infill development and ways these barriers can be overcome. Likewise, regulations should be examined to determine where ordinance incentives for in-fill development are in place or could be added. Mixed uses and a variety of land uses should be permitted to help increase site development potential. Permitted land uses should be appropriate within the surrounding context. Buildings conversions and reuses can specifically be permitted to promote in-fill on underused sites. Lot area requirements should not overly restrict development of existing lots and should provide for varied lot areas. In-fill lots may be irregular in shape, size, or other features and not conform to zoning, thus complicating or possibility disabling their development. Nonconforming lot standards should also be considered. Setbacks standards may exceed what is possible and serve to discourage in-fill. Reducing required setbacks by using an average of the existing setbacks on surrounding lots or by permitting build-to lines could allow standards compatible with that of the existing neighborhood character. Building height criteria should be sensitive to the height of surrounding buildings and encourage gradual transitions between buildings of different heights and stepped back design on taller structures. When taller buildings are proposed in commercial or other areas, pedestrian scale should be maintained on the ground floor through building design, streetscaping, and landscaping. Parking requirements should provide flexibility and reflect actual demand since on-site spaces may not be available on smaller lots, especially in town centers. Parking options such as paying a fee-in-lieu of providing parking, shared facilities, or shared parking spaces between different land uses, as well as on-street parking, could be considered. Impervious coverage should be reviewed since in-fill development involves more compact development patterns. Lot area and coverage needed for infill buildings, parking, and paving will typically be higher than for new development. Performance standards can provide greater flexibility in development, taking into account varying site conditions. Design standards can regulate certain aspects of design, such as buffering, parking, and streetscaping. Incentives should be considered in municipalities with large-scale in-fill sites available to increase development potential and project feasibility. For example, density bonuses or a wider variety of uses could be offered to projects that contribute to community goals or are located in targeted areas. Transferable development rights could also be used in conjunction with development of targeted areas. Land Development Considerations: Streamlining the project review process within the municipal subdivision and land development ordinance (SLDO)is an option that can be particularly helpful in facilitating infill projects. Development review can be expedited to avoid unnecessary delays that can lead to decreased project feasibility and increased costs. Municipalities should promote, but not require, sketch plan review and schedule meetings with neighborhood organizations or potential project opponents early on to help avoid later conflicts leading to delays. Municipalities can offer shortened review periods or expediting review for smaller projects. Though, provisions should still ensure continuation of the existing street, alley, and sidewalk network and street tree patterns. While often a single uniform development review process with set requirements applies to most all development projects, from small single lot infill to multi-acre greenfield projects, having certain requirements for in-fill development in the SLDO and for municipal permits can address the specific needs of infill and encourage its use. For example, in zoning "uses by-right" encourage projects that meet established criteria to receive quicker approval and permitting. Since this approach facilitates municipal reviews, establishing active community participation in planning, community trust, and well-defined policies and implementation measures are important considerations. Building Codes: Where in-fill development involves converting or reusing vacant or underutilized structures, municipalities can employ the flexibility built-into in the Statewide Uniform Construction Code for existing structures in meeting code requirements. The Code provides an International Existing Building Code elements plus standards for, and in certain situations exempt, historic structures. This is important for older or historic structures, which due to their design and construction, may be unable to meet code standards otherwise generally geared for new construction. In addition to setting planning policy and addressing land use regulations, municipalities can take other measures to make in-fill development more feasible and encourage its development. The following are possible actions that can be employed along with policy and regulatory measures to promote in-fill development. These actions involve both indirect and direct strategies. A primary barrier to infill can be community opposition. It may be due to concerns about poor quality or incompatible design, overcrowding of facilities, and increased traffic congestion. Community resistance can serve as a major disincentive to developers. Unlike development of greenfields, in-fill sites are located in established municipalities, and thus community involvement in specific projects and overall community acceptance of in-fill is key to project success. Design guidelines (discussed above) are one method that can help address and mitigate these concerns, and community participation should be incorporated into the design guideline process. Community involvement in the establishment of long-range planning policy can diminish later conflicts, as well as establish a basis for trust between the community and local government necessary for municipal advancement of and incentives for in-fill development. Municipalities can provide educational information about public benefits of in-fill and compact development, as well as well-defined policies and regulations that reflect community sentiment. Serving as a liaison and helping to mitigate conflicts that may arise between developers and community organizations as well as working collaboratively with interested groups are two additional roles a municipality can play to facilitate in-fill projects. Municipalities can invest in infrastructure improvements and provide public facilities and services in target areas to increase the attractiveness of in-fill development. They may invest directly in improvements or can strategically locate facilities and services to attract outside investment. Existing facilities, services, or infrastructure may be inadequate. For example, undersized or deteriorated piping or lack of direct road access can inadvertently serve as disincentives for new in-fill projects. Where these types of limitations exist, municipalities can provide public investment to improve the existing system. By targeting improvements, municipalities can benefit from the cost savings of containing development within the existing service area and using compact development patterns. These savings are realized because of long-term lower costs of providing infrastructure and facilities within a concentrated area, rather than to an extended network. Through capital improvement programming and budgeting, municipalities can provide for necessary infrastructure and public facilities improvements. Improvements can include site-specific upgrades and construction of new facilities, such as a community center, in target areas. On a broader scale, improvements can be part of a development plan for a larger land area, such as town center revitalization. Facilities and infrastructure improvements may involve sewage service upgrades, roadway capacity, or streetscape and parking improvements, while services such as maintenance of vacant parcels, code enforcement, blighted, abandoned building demolition, and road repair can help enhance an area and improve its attractiveness for investment and development. Since higher financial risk can be associated with in-fill development and overall costs may be greater, municipalities can offer financial incentives to help spur infill development. Assistance can take the form of direct funding, assumption of loan interest payments, obtaining grants, loan guarantees or letters of credit, or encouraging lenders to provide loans or furnish low interest rates. Other strategies include tax or fee reduction, tax-exempt bonds, technical assistance, project endorsement, land banking, and land acquisition, or exchange of parcels for in-fill projects. Sharing or undertaking infrastructure or site improvements, parking, or site remediation are other methods of providing financial assistance. Financial assistance can apply to various elements of project costs, including feasibility analyses, demolition or site clean-up, or construction, dependent on the nature of the project and assistance required. Municipalities can provide varying forms of assistance to help offset costs and facilitate project initiation and completion. For example, they may lease space in infill developments, purchase goods from infill businesses, assist with funding/grant applications, facilitate public outreach, interface with other parties for technical assistance, work with lending sources to promote funding for in-fill development, create regulatory incentives or a climate conducive for infill, or share market and other information for in-fill studies. Additionally, a current inventory of vacant parcels featuring key sites can be available as a way of advertising appropriate sites for in-fill development. This allows developers to be aware of a municipality's support and proactive role in infill and gain needed information about possible sites. This also allows municipalities to have a forum to provide information about assistance available in undertaking in-fill projects, such as potential partnership opportunities. Possible risk of and actual environmental contamination issues are another obstacle for in-fill projects on former commercial and industrial sites. Municipalities can address this issue by informing developers about sites that have potential contaminants, helping facilitate site remediation, or providing information about state programs such as PA Land Recycling Program. Provide support that makes in-fill development attractive to developers and encourage such development that is attractive to the neighbors. Promote and engage in collaboration among various interested parties, such as public officials, neighborhood organizations, developers, and financial institutions. Recognize where the best opportunities exist for infill that reinforces and reflects community goals for future growth and development. Understand the surrounding community context and ensure that the in-fill project relates to that setting. Work with the development community to address specific community needs, such as diverse housing opportunities. Address real and perceived barriers that have prevented past infill development, such as nonconductive regulations, community concerns, and site constraints including contaminates. Examine current and past planning techniques and consider whether other measures, such as those discussed under this tool, could be used either in addition to or instead of current techniques to help encourage in-fill development. Pennsylvania Municipalities Planning Code enables municipalities to establish land use controls, such as zoning and subdivision ordinances, which can accommodate provisions for in-fill development and regulate appropriate uses and development design. NC-2 Neighborhood Conservation District: In this district, a reduction in building setbacks is permitted for new development to maintain the character of existing building setbacks. Setbacks can be reduced when the majority of the existing buildings have a nonconforming setback, but it needs to conform to the setback of the majority. Traditional Neighborhood Development (TND) Option: A TND option is permitted within the NC-1 District and is intended to maintain the existing physical character of the borough through promoting the continuation of traditional town development. Standards, such as build-to lines that reflect the majority of the block, continuation of the street and alley system, adaptive reuse for residential purposes, and infill design consistent with the existing dwellings in terms of access and setbacks, create an atmosphere favorable for infill development that is compatible with its surroundings. Strategies for Successful Infill Development (2001). Northeast-Midwest Institute and Congress of the New Urbanism. Building Livable Communities: A Policymaker's Guide to Infill Development (1995). Center for Livable Communities, Local Government Commission, Sacramento, CA.